Today is your beloved sister’s special day, so of course she’d be expecting to hear from you! And there is no day more appropriate to fill her heart with joy than the annual celebration of her life – her birthday. Here are some quotes that will not only let your sister know how much you treasure her but also make her smile and inspire her to put her best foot forward. This year, I decided to immortalize my feelings for you by getting your face tattooed on my buttocks. Ain’t that awesome!? Happy birthday. Every time I’m away from you and see a picture of your face, I shed tears of sadness. 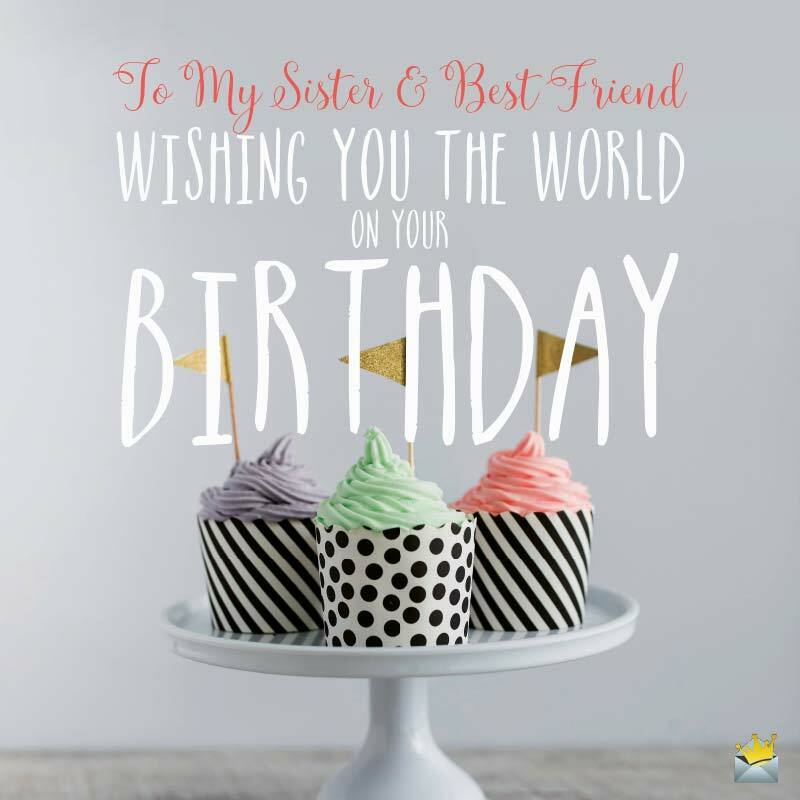 Happy birthday from afar, sis. As you age and progress in life, I want to inspire you to continue to strive to be all that you can be – in other words more like me. Happy birthday! You will always be my number 1, despite your looks. Happy birthday, sis. As a gift this year, I promise not to reveal that you’re secretly a crime fighting vigilante. Happy birthday my sister, my hero. No matter what great things I may go out and accomplish in life, I want you to know I’ll always consider you more of a man than me. Happy birthday, my sweet sis. Now that you’re old enough, I want you to finally be free and enjoy life, like a beast let out of its cage. Happy birthday. There’s a great person lying dormant deep, deep inside you, and I’m confident one day she will come out. Happy birthday. Our relationship has had its ups and downs like a roller coaster, but know that I’ll always be there to loosen your seatbelt if need be. Happy birthday. To my Sister & Best Friend, wishing you the world on your birthday. I heard that your species is going extinct, so I bought you an extra special gift this year, just in case I don’t get the opportunity to do so again. Enjoy your birthday! As sugar that rots the teeth, so is the sweetness of my sister. Happy birthday! Even though I have a passive-aggressive fear of you, this year I decided to be brave, present you with this gift, wish you a happy birthday and also remind you of my undying love. Sis, I’ve been waiting for you to reach this age to tell you the truth – you’re a clone, but the very best clone we could have ever could ask for. Happy birthday. As a parole officer instructs a criminal to keep him out of mischief, may your words of guidance and instruction always be with me in my life’s journey. Happy birthday. Just as your weight increases annually, my love for you also grows with each passing year. Happy birthday. I’m sad, even enraged, that I can’t be with you on this special day, so please accept this gift as a symbol of my love until we meet again in the near future. What a miserable life, indeed world, this would be without you. Happy birthday, my precious little sister. If life were a storybook, you would be a fairytale princess. Happy birthday to the perfect sister. You have done for me more than anyone in the entire universe has ever done for me, and I can’t thank you enough for that. I love you and hope to enjoy sibling-hood with you for countless years to come. Happy birthday. 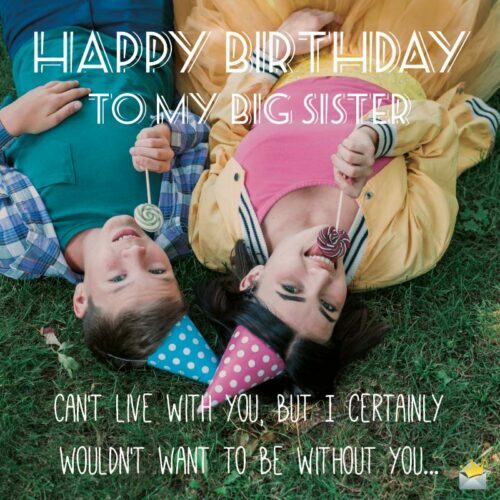 You have a smile that can light up any room, a smile that makes me proudly proclaim, ‘That’s my sis!’ Happy birthday. Love you always. God had mercy on this family when He gave us you. Happy birthday. Growing up with you has been hands down the most enjoyable experience of my life. Happy birthday. A sister is just like a brother, only a thousand times more beautiful and compassionate. I pray whatever hardships you may face in the future that they will never be able to subdue your charm. Happy birthday. When you were born it was like a doll baby come to life, and now you have grown up to be an incredibly beautiful Barbie. Happy birthday! I know that I spend more time playing video games then I do with you, but that doesn’t mean I love them more. Happy birthday, my cherished sister. The thing I like most about being your brother is that no matter what happens, we will always have a reason to stay in touch. Happy birthday, beloved sis. Hope your birthday blesses you with a fairytale life. I know that these days we only get the chance to chat on Facebook, but I feel your heart is and always will be in close proximity to mine. Have a memorable birthday, sis. Happy birthday sis, and may our lives continue to be brightened by your presence. You are my inspiration, dear sister. Beloved sister, on the day you were born, a beautiful song was written on our hearts that has never stopped playing since. Happy birthday. For years, I looked forward to living away from you, but now that it has finally happened, I feel a vast emptiness inside. Happy birthday, my dearest sis. I miss you. I don’t know if God hears my prayers, but if He does, I pray that today marks the beginning of the best era of your life. Happy birthday. Happy birthday, dear sis. I’m beyond confident that God has blessed you with all the tools to conquer any challenges you may face in the future. Joy and prosperity are further away than you would like, but closer to you than you think! Happy birthday. Dear sis, I hope that life takes you places so great you never imagined and that all of your pleasant dreams become a reality. Hard to believe one day you’ll be a mother, grandmother and even great-grandmother. Happy birthday, sis. I wish you many beautiful children and a life full of joy. Every time I feel like giving up, I think about you, your strength and perseverance. Please continue being an inspiration to us all. Happy birthday. Our family is full of great people, but you’re the best! Happy birthday, and may you experience many, many more, each more glorious than the previous! You are the strongest amongst all of us and have always been an inspiration and role model to me, even when I don’t express it. Happy birthday. May the trials, challenges and tests that continue to accompany you in your life’s journey serve as the origin story for the superhero we all know lies within! Have yourself a birthday that shines like the sun. As your days increase, may your self-esteem also grow to eradicate all forms of self-doubt and depression out of your life. Happy birthday.